A number of interesting plants are found grouped under the name of the Mallow family. They are the common mallow, a weed of waysides and cultivated grounds ; the Indian Mallow or Velvet-leaf, with its large, velvety leaves and yellow flowers, a visitor from India, which has escaped from cultivation and become a pest in corn and grain fields and waste places; the Musk Mallow, which has also escaped from our gardens; the Marsh-Mallow, the root of which abounds in a mucilage that is extensively used in the manufacture of confections; the Hollyhock of our gardens, which was originally a native of China, and the beautiful RoseMallow of our illustration. The mallow family includes about eight hundred species which are widely distributed in the temperate and tropical countries. All are herbs. Most of those found in the United States have been introduced from Europe and Asia. Only a very few are native, and no one of these is very common. The flowers and fruits are all similar in structure to that of the common hollyhock. The disk-like fruits of the common round-leafed mallow of our door-yards are often called " cheeses " by the children and are frequently gathered and eaten by them. The cotton plant, one of our most important economic plants, is also closely related to the mallow. The cotton of commerce is the woolly hair of the seeds of this plant, which is a native of nearly all tropical countries, and is cultivated in temperate regions. 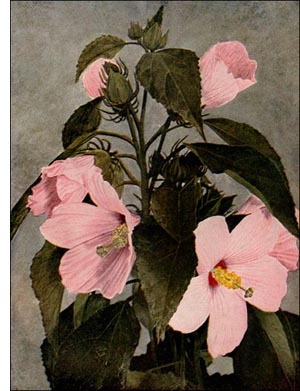 The beautiful rose-mallow has its home in the brackish marshes of the Atlantic seacoast. It is also occasionally found on the marshy borders of lakes and rivers of the interior. The plants grow to the height of from three to eight feet. The leaves are egg-shaped and the lower ones are three-lobed. The under side of the leaves is covered with fine and soft whitish hairs. The flowers, produced in August and September, are large, varying from four to eight inches in diameter, and may be solitary or clustered at the top of the stem. The color of the petals is usually a light rose-pink, but occasionally white, with or without crimson at their bases.